Blocking the knitted items is tedious, but necessary for our projects. Usually, my set of blocking mats is enough to accommodate most of the garments I knit. In fact, sometimes I want to occupy my entire dining room with it on purpose, but that is another story. However, this is not the case of my just taken off the needles poncho knit with our super soft ARAN yarn. It is also not the case of the 7.5 feet wide shawl a friend of mine recently had to block. As you can see in the image, the mats are merely enough to hold only half of the poncho. Buying additional mats or using my bed to block, therefore risking wetting and destroying my mattress is not required. Don’t directly fold your item! The folds will memorize their shapes and appear as unwanted wrinkles once they dry. Place your knitted item on the mats (for my poncho I am using wet blocking) and start spreading the fabric to required measurement. Use pins to secure in place. Wet knitted fabrics are slippery and floppy. Check regularly the alignment of your stitches. Place a simple ruler and see if stitches lay on the same row. Secure with pins if necessary. Continue until about 2 inches of the mats remain uncovered. If you have a cowl, sleeves or other tube-type elements, do not leave them to dry flat (see above for the wrinkles). Fold a towel and tuck it inside the tube, making sure the fabric is not twisted. 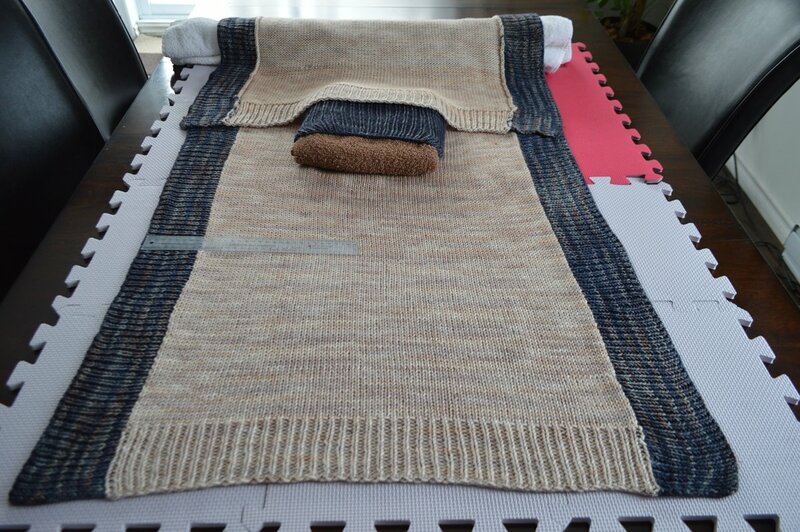 Roll a big towel and place it on the item, fold the rest of the knitted fabric over and continue spreading it back. You can place as many towel rolls as you need and change the direction of the blocking until you have the entire piece spread evenly. Posted in Tutorials and tagged Blocking.